The ICandy Raspberry has my favourite combination of features! 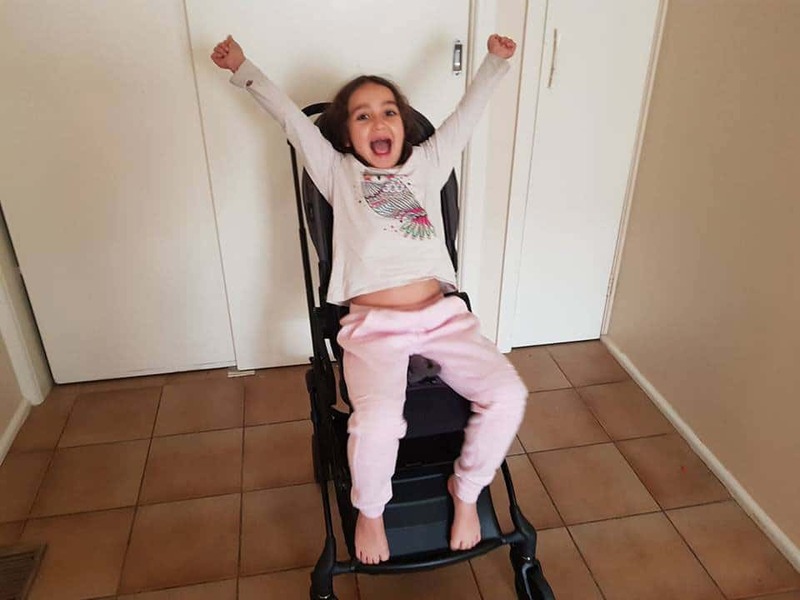 The seat lays completely flat to be suitable for newborns, it has a massive weight capacity of 25kgs AND folds with the seat attached facing in EITHER DIRECTION. Love it. It also has a lot of other features I look for in a pram, like a one handed recline, telescopic handle bar, proportionally big basket (for such a lightweight pram). It also comes with height extenders that lift the seat up into a much higher position. And also closer to you. So it’s really sweet for having your baby higher and closer for having a chat. 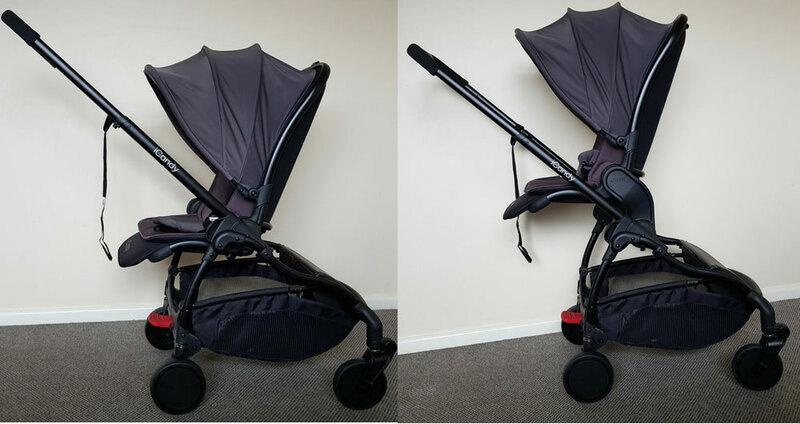 Though you can easily remove the extenders if you need the pram to fold more compactly, as they do make it a little more awkward. Back to the basket – the ICandy Raspberry has a very cool little feature. 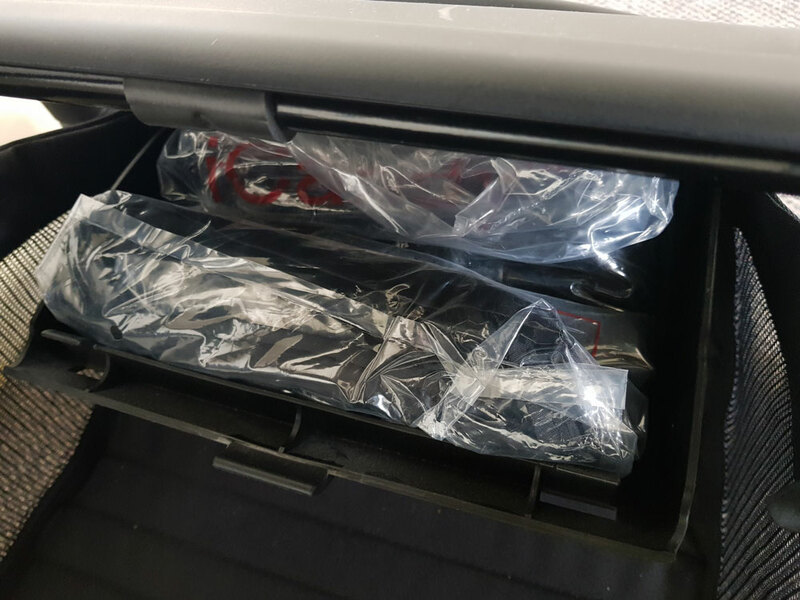 Inside the basket is like a “glove box” compartment. It’s hard plastic and closes securely. I think it’s intended to be a perfect storage space for the rain cover – which comes with the pram. But I would personally use it to keep a handful of emergency essentials, like a couple of nappies, packet of wipes, and maybe one small simple outfit for bubs. 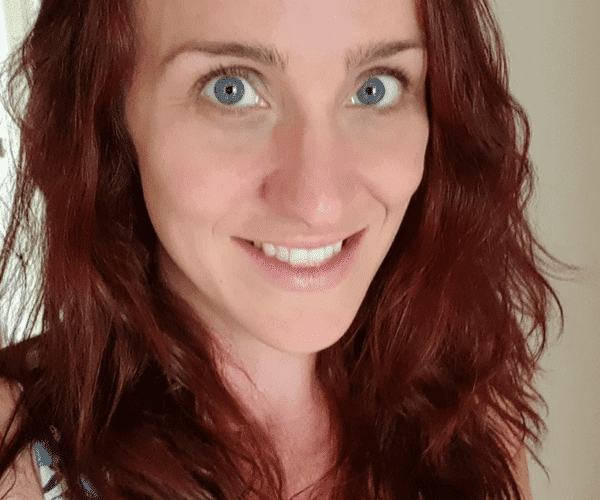 Just as a backup for those times where I’ve either raced out the door without a nappy bag OR for when we’ve had a day of continuous nappy blowouts. The ICandy Raspberry has a good sized hood. It’s not really extendable, but it’s made of that stretchy “Neoprene” fabric that seems to be popular in prams lately. And it comes in a range of bright colours! With the hood you actually buy the hood separately. They’re $79 and they’re called a “Flavour pack”. The idea with the ICandy Raspberry is you buy the base and then add on to “style” your pram how you want it. So you also need to buy the seat liner separately. Which I think is essential. The seat does feel like it would be uncomfortable without it. You might be able to get away with putting a toddler into the seat without a liner but I’d strongly suggest getting either the liner for the “newborn pod” if you’re having a winter baby, because the “newborn pod” goes on like a sleeping bag to keep baby cozy and warm. Below is with and without the seat liner to give you an idea about what I mean. It’s a city and suburban pram. It’s a very narrow 52cms so you won’t take up the whole footpath and it’s great for public transport. It has a little bit of suspension, but really it’s not designed for off-roading. It’ll handle a bit of suburban terrain – like flat grass, maybe some firmly packed playground mulch, but that’s about it. Otherwise it’s perfect for cruising around shopping centres and sealed footpaths. But especially with the height extender it’s a perfect city pram because it boosts your baby or toddler up to table height. So it’s perfect for stopping in for a coffee and a baby chino and just parking the pram up at the table. Especially when the pram has such a small footprint, it won’t take up much more room than a regular seat. Despite the huge weight limit of 25kgs it’s not a particularly big seat. I put my 24kg six year old in the seat and she was just ridiculously too big. And absolutely no way could to do the straps on a child her size. It’s still a reasonably good sized seat though for a compact pram! It’s 30 cms at the base, but it’s narrower up at the shoulders. It’s 54cm to the top of the backrest and 57cm to the top of the hood. So you’ll get at least 3-4 years out of the pram. Which isn’t bad at all! I’m just saying it’s unlikely you’ll ever get a child who is 25kg and still actually fits into the seat. Overall the ICandy Raspberry is a very cool little pram, it comes in a range of fun colours! It’s perfect for someone looking for a small pram packed full of big pram features! 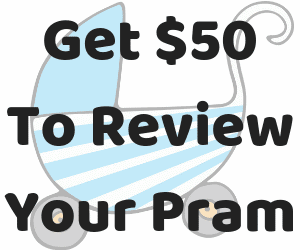 If you’re still looking for the best pram for you please check out all our pram reviews here! 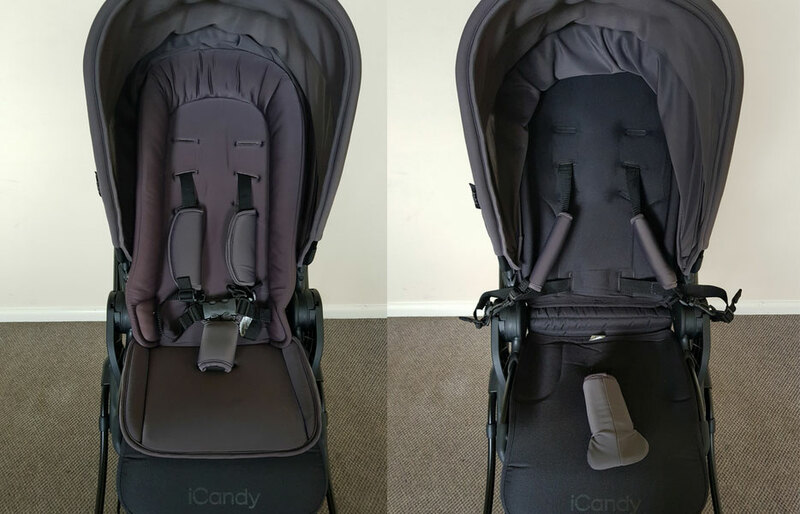 I borrowed the ICandy Raspberry to review from the lovely team at Baby Train.